Les Americains sont gros porcs. I don’t know if you’ve heard but Kentucky Fried Chicken released a new sandwich on April 12th. 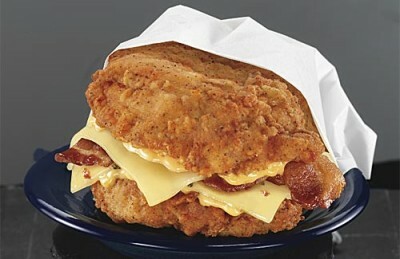 It’s called the Double Down. 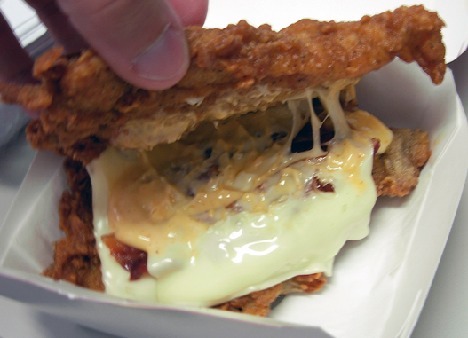 The new KFC Double Down sandwich is real and it’s coming April 12th! This one-of-a-kind sandwich features two thick and juicy boneless white meat chicken filets (Original Recipe® or Grilled), two pieces of bacon, two melted slices of Monterey Jack and pepper jack cheese and Colonel’s Sauce. This product is so meaty, there’s no room for a bun! I’m thinking people should be required to submit a recent angiogram before ordering. Or, at the very least, produce a note from their doctor saying they’re unlikely to drop dead on the spot. Needless to say, KFC sales on April 12th sky-rocketed. Because people couldn’t wait to get their grubby mitts on this. Wow. Only in America do we pass a National Healthcare bill, pull Diet Coke from schools and then turn around and belly up to KFC in droves for the Double Down. I guess what they say about us is true. Isn’t it? OMG! That actual photo is D.I.S.G.U.S.T.I.N.G!!! !